Alf Turner's Dragon Pork Pie Review - Dare we take on the Dragon?! We Pierateers are still amazed at how many unique flavours of pies we still come across considering we've been rating pies for over 6 years now - and eating them for much longer than that! How many flavours of pies are out there?! We may never find out! 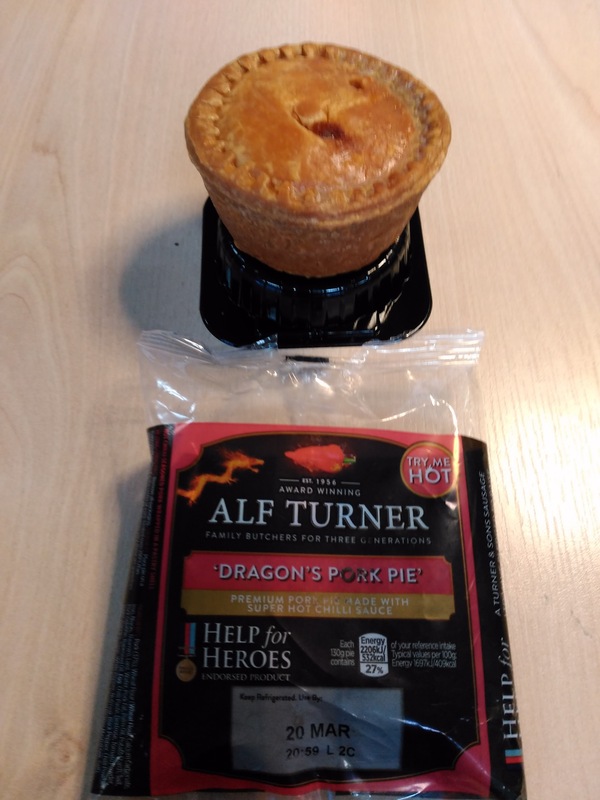 But our job is made that much easier when we get sent some interesting new flavours to try out, like this Dragon's Pork Pie from family butcher Alf Turner. Established in 1956, Alf Turner and Sons Ltd have been a family butchers for three generations now but the pork pie they've just released is certainly something a bit different! 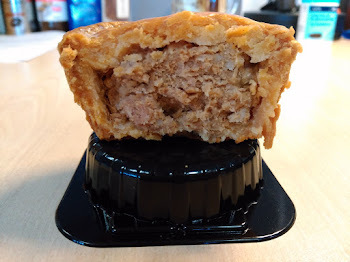 Containing hot chilli, this is a pork pie that is designed to give a real kick to each bite! Having worked with BBC TV's Dragon's Den entrepreneur Peter Jones, they have a new Dragon Pork Pie and Sausage Roll out, to follow on from their Dragon Egg previously released. And boy does it pack a punch! But not only does it give you a taste sensation like very few other pies available, by purchasing these pies you'll be contributing to the money being raised for charity Help for Heroes! An enjoyable pie and giving back to charity - what's not to like! Especially as the Dragon's range has helped contribute to over £100,000 being donated to Help for Heroes. What a great achievement - and we're sure sales of these pork pies will help even more! The pork pies looked simple but effective. A deep brown colour hinted at a lovely crunch to the pastry. Jelly oozing out the top indicated it was moist. I am pleased to say that both these things it delivered to a standard within the upper echelons of the pork pie market. Indeed it could have been a Melton Mowbray with the good quality pork meat used. In terms of flavour, the first bite was not unlike the competition, it didn't taste a world away from a standard pork pie. However after a few bites the tongue began to tingle as the chili announced its presence. I then realised it had been there all along, increasing the flavour of the pork filling in a subtle, but important, way. Without the chili the flavour might have been bland. Other pork pies rely on salt and pepper, which can work, but it was nice that this pie beat blandness in a slightly unusual way. Often pork pies can be too salty but this one was not. There wasn't much to criticise, the top pastry was a bit soft given the jelly on top and perhaps the pie could have been bigger. Maybe the chili could have kicked in sooner but then it may have become too hot for some people. However these are minor flaws and this is definitely a pork pie I would be happy to recommend. Thanks to Paul at Alf Turners Butchers for sending us the Dragon's Pork Pie and Sausage Rolls to sample. We wish them well in raising lots more money for charity and all the views above are genuinely what we and our friends thought of the products.